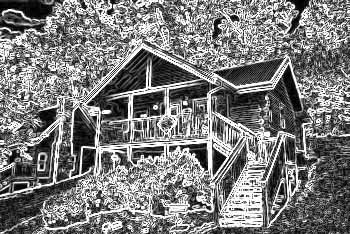 You'll love the incredible views and convenient location of Summit View cabin rentals in Pigeon Forge, TN! Like many of our other resort cabins near Dollywood, these log cabins are located in the Upper Middle Creek area. Nestled on forested mountain tops, these cabins afford great vistas of the Smoky Mountains that are sure to make your vacation unforgettable. This gorgeous resort is surrounded by a Smoky Mountain forest and even features a beautiful creek running through the property. With luxury amenities, beautiful mountain scenery, and the company of your friends and loved ones, you're bound to have an awesome stay in the Smokies! Though you'll surely want to spend time at your comfortable Pigeon Forge cabin in Summit View Resort, you won't want to miss out on the fun attractions that are only a few miles away from your cabin. Many rentals here rest only about 1.5 miles away from Dollywood. Similarly, the thrills of the Pigeon Forge Parkway rest only about 5 minutes away from these superbly located cabin rentals. For other gated resort cabins near Dollywood with amenities like resort swimming pools, be sure to check out our rentals in Hidden Springs Resort! Best of all, you book a cabin in Summit View or any of our other log cabins, you'll receive a special 15% discount on your stay! Make memories to last a lifetime and stay on top of your vacation budget when you book a quality log cabin with Cabins USA! Stay at "Simply the Smokies", a luxury 4-bedroom Pigeon Forge cabin in Summit View Resort only 6 miles away from Dollywood. Enjoy views and a rate discount!